Birds, and particularly Australian native birds, featured prominently in Nolan’s Australian desert landscapes during the late 1940s and early 1950s. The fact that he returned to this subject during the 1980s, when he was living semi-permanently in England, attests to his fascination with Australian birds. These two paintings, Bird (Birds 7) and Moor-hen (Birds 2), were created in 1982 and they are distinctly different from Nolan’s earlier representations of birds. Here the birds appear more lifelike and they are shown close-up against a white background. 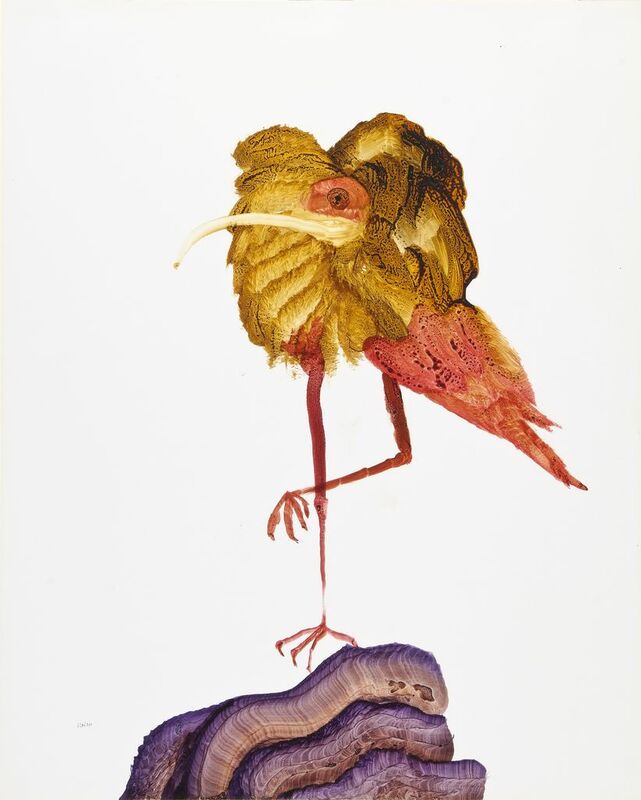 In many of Nolan’s earlier images, including Desert bird (1948) and Desert thorn (1953), the birds resemble mythical creatures which are airborne (often upside down) and they form an integral part of the landscape. In these two paintings the bird rather than its environment is the centre of attention.